The ONLY NON-ETCHING BASED AntiSlip system in Sweden. 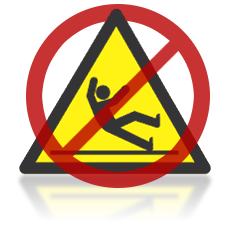 The antiSLIPsystem® is the most Advanced, Non-Etching and Invisible Floor Safety Product available. The antiSLIPsystem® is applied in 3 steps. 3-5 years effective. It is suitable for most stone floors, like tiles, clinkers, glazed tiles, terrazzo, marble, granite, constructured stone, concrete and porcelain. Why should one use the antiSLIPsystem®? To reduce the number of Slip and Fall Accidents. According to a research done by the CBS has shown that many accidents occur by slipping on wet or slippery floors, which can result in broken bones and, in a few cases, even death. The most dangerous and the most neglected aspect out of the three components that is floor, ceiling and walls, which make up a building's envelope is the floor with poor slip resistance accounting for numerous slips, trips, falls, leading to absence from work. Safe flooring should be considered as part of the design of the building and systems at work.